It's been over a month since Team 17 last announced a Worms game, and so Team 17 has announced another Worms game. This one is called Worms WMD. 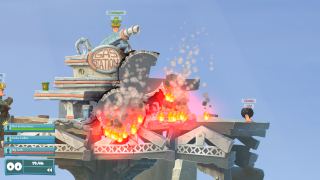 In a format familiar to people who have played previous Worms games, Worms WMD is a 2D turn-based team deathmatch. This time, though, there are a couple of new twists. For the first time in the series, players will be able to use vehicles and enter buildings, increasing the options for invertebrate mayhem. Worms WMD planned for release early next year, on PC and Xbox One. If you're going to be at Gamescom between August 6 and August 9, you'll be able to try out an early hands-on demo.